Twas another hot lunch Wednesday that Faith decided she didn't want, so I needed two lunches again. Back into my freezer stash I go. Thankfully, the muffins thawed before the picture, but the berries didn't. They are perfectly fine berries, just still a tad bit frozen!!! Ben had a chicken & veggie stuffed muffin, a blueberry mini muffin, blueberries and blackberries, some cheese and a mini Nestle Crunch bar (it's cut in half in the bottom left corner) from his Easter basket. 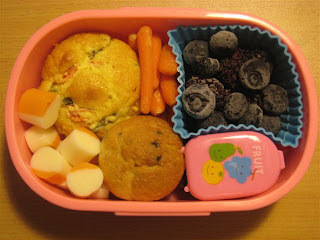 Faith had mostly the same (chicken/veggie muffin, blueberry muffin, cheese, blueberry & blackberry mix, mini Nestle Crunch) plus carrot sticks and ranch dip in the cute little "Fruit" container from my friend Michelle. It is too cute and Faith loves it! Oh and PS, I love your blog! 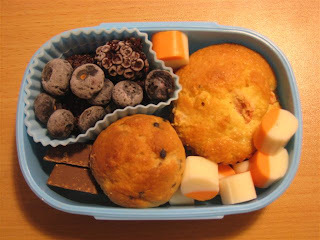 I've been to a few other bento blogs but they have things that are kinda crazy that I don't think my son would even consider eating. I like that yours is pretty simple and pretty normal foods, instead of super-off-the-wall stuff. My kid isn't picky, but he's also not adventurous. I am so inspired by your posts (just found you tonight)! Thanks for sharing. I'm wondering if you'd mind sharing the chicken/veggie (?) muffin recipe?